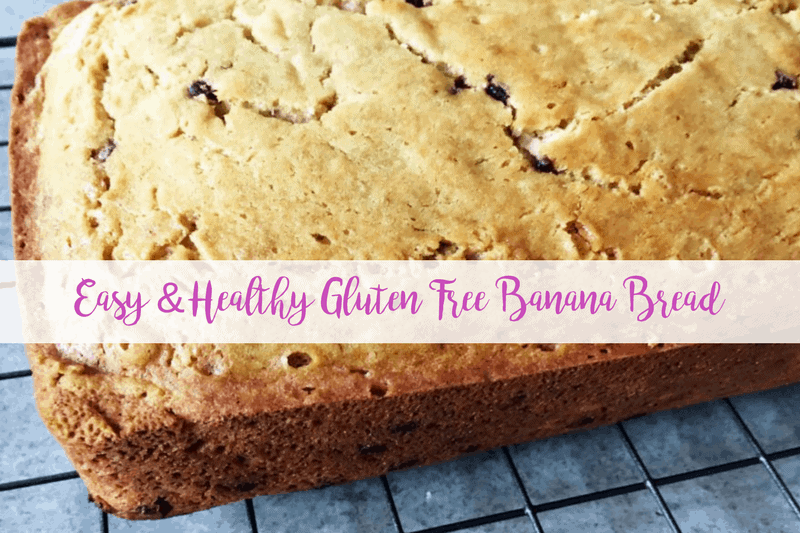 The most delicious gluten free banana bread recipe – here it is! When I became a wife (10 years ago!) I did what all new wives do and I decided to start using my brand new KitchenAid mixer to bake things. and make things. With all of my brand spankin’ new cookbooks and cooking utensils! One of the recipes that I absolutely loved was a healthy version of banana bread. 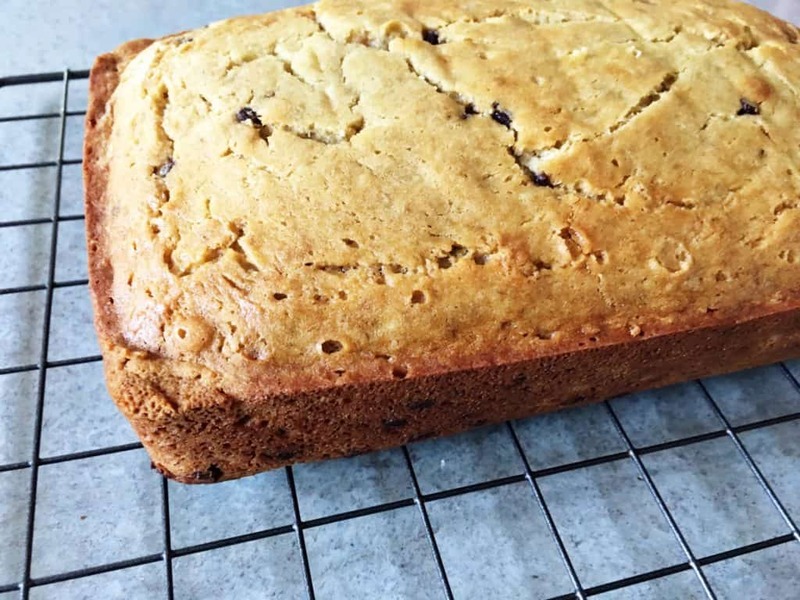 This gluten free banana bread recipe is husband approved! We are currently on week 2 of the 3 week yoga retreat (check out week 1’s review here!) and our nutrition is very heavily plant based and doesn’t leave room for that many treats. The hubby grumbling started around Day 6 when he was craving a treat. He said “remember when you used to make banana bread all of the time? 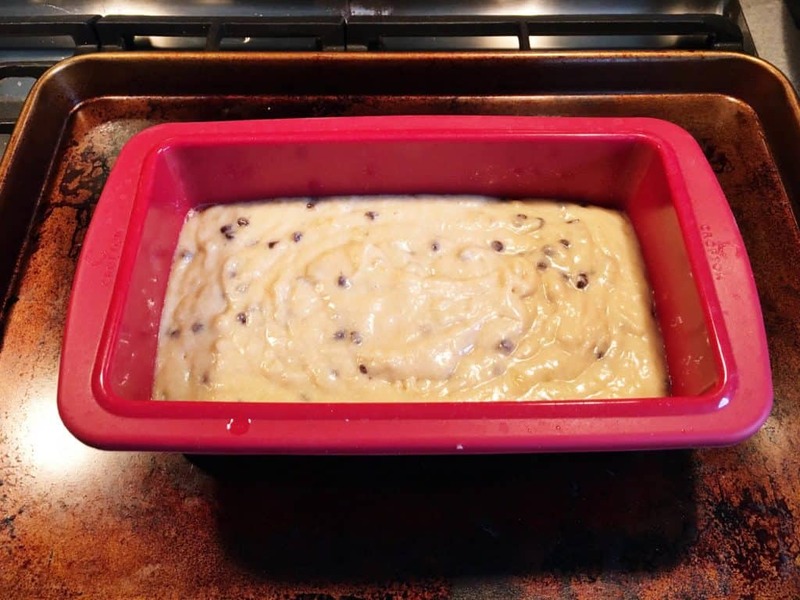 ?” So I decided to break out some of the baking tools, get my big girl helper to lend some assistance and we decided to make some banana bread for Daddy, this time will a few tweaks to make it a little less indulgent, but still super yummy! Enjoy! 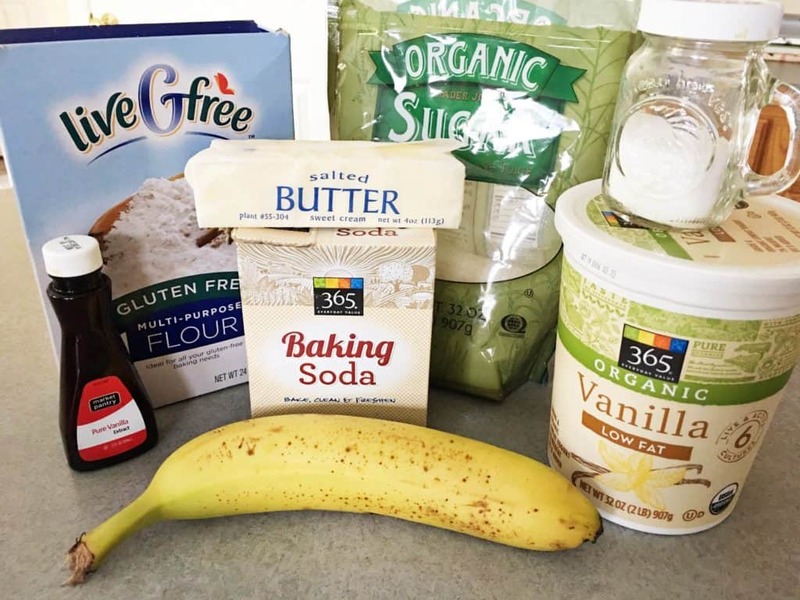 My favorite tools for healthy baking success! You can still bake and eat healthy. It’s all about healthy ingredient swaps and being mindful of portions. This post contains affiliate links. Please see my disclosure policy for more info! Measure flower into measuring cups and level with a knife. I like to sift my ingredients together, but its not necessary. You can also mix the flour, baking soda, and salt with a whisk. Put sugar and butter in a large bowl and beat until well blended. Add eggs one at a time and beat well. Add in the bananas, yogurt and vanilla and beat until blended. Then you add the dry ingredients, in 3 parts, until just blended. 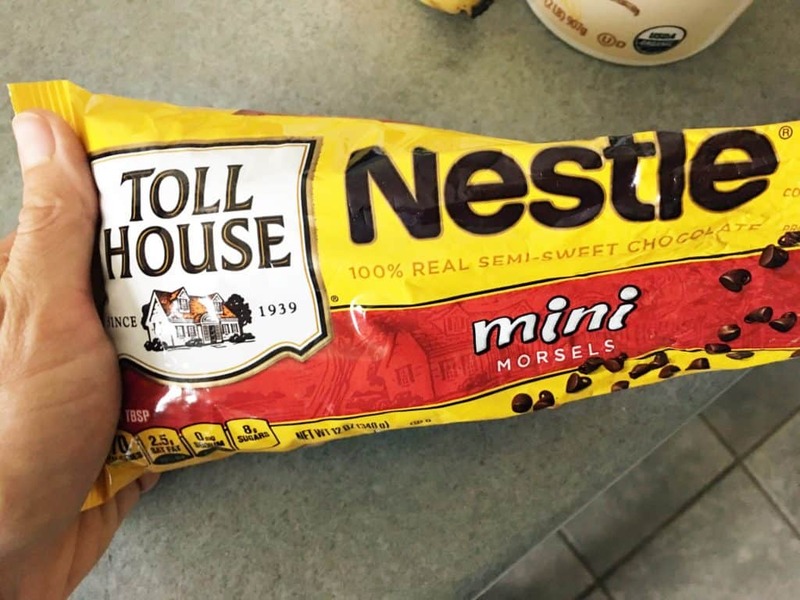 Stir in chocolate chips or other add-ins if you are using. Coat a loaf pan with cooking spray (I used Trader Joe’s coconut oil spray) and spoon the batter in. Bake at 350° for 45 minutes or until a toothpick comes out clean. Cool for a bit in the pan then let bread cool on a baking rack. Are you a fan of banana bread? What is your favorite healthy breakfast recipe? Join 20,312 other followers and subscribers in getting more healthy family recipes right to your inbox! Download your FREE weekly meal planner below! This bread will go quickly in my house! Thanks for sharing! Looks so good and easy to make. Thanks for sharing. Oh this looks SO good! I love bananas and choc. chips and this is good for me?! WIN WIN! Thanks so much for sharing this. Going to see what I’m missing so I can make this over the weekend. so yummy!! hope you enjoy! Mmm! I love a good banana bread recipe! Specially one with chocolate chips! me too girl! so yummy! This looks SO good. I am GF and always looking for ways to make my previously wheat laden favorites. Mmm now I’m craving warm banana bread. Going to have to use up our bananas. I love Aldi’s gluten free products. Coconut sugar is amazing! Sounds like this will be healthy and delicious! Chocolate chip banana bread is my jam! So yummy! This sounds delicious! I had to start eating gluten free about a year ago, and I sure do miss banana bread. I’m going to try this! oh good!! hope you enjoy! Wondering if we can sub something for the yogurt to be dairy free? Thank you- excited to try this recipe!! So Delicious makes a really good coconut yogurt. I would try that!